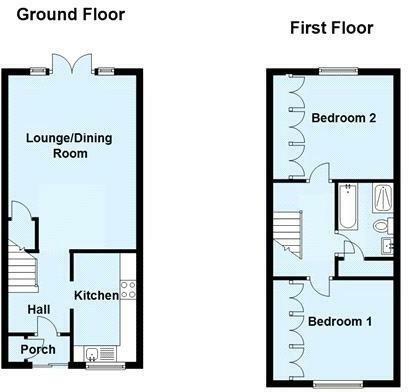 This modern terraced house is situated in a popular development close to local amenities. To the ground floor is a light entrance hall, a recently fitted contemporary kitchen, with integrated appliances and a bright lounge/dining room leading to the rear garden. The first floor comprises two double bedrooms and a good sized modern bathroom. Externally, there is a lawned front garden, private rear garden, mainly laid to lawn with a patio area and garden shed. The property benefits from a garage en bloc. It is within easy access of Orpington High Street, Nugent Shopping Park and both Orpington and St Mary Cray Stations, local bus routes and the M25/M20 motorways. Internal viewing is recommended. Exclusive to Proctors. Part glazed entrance door, cupboard housing meters (with new fuse box), ceramic tiled flooring, radiator, room thermostat, stairs to first floor. 3.46m x 1.93m (11' 4" x 6' 4") Recently installed with a range of contemporary gloss wall and base units with contrasting worktops, integrated electric double oven and electric hob with extractor fan, integrated dishwasher and washing machine, space for fridge freezer, sink and drainer with swan neck mixer taps, double glazed Georgian style window to front, ceramic tiled flooring. 3.73m x 5.45m (12' 3" x 17' 11") Double glazed window to front, double glazed French doors opening onto rear garden, two radiators, wood effect laminate flooring, under stairs storage cupboard, wall light points, tv point. 2.98m x 3.72m (9' 9" x 12' 2") (into wardrobes) Double glazed full height window to front, fitted wardrobes, radiator. 2.90m x 1.88m (9' 6" x 6' 2") Modern white suite comprising, low level WC, panelled bath, hand wash basin set on vanity unit, shower cubicle with drench shower head, medicine cabinet, ceramic tiled flooring and part tiled walls. Approx. 55 ft. Paved patio area, laid to lawn, well fenced, garden shed. We understand from the vendor that there is an estate charge of approx. £195 per annum. Disclaimer - Property reference 13284524. The information displayed about this property comprises a property advertisement. Rightmove.co.uk makes no warranty as to the accuracy or completeness of the advertisement or any linked or associated information, and Rightmove has no control over the content. This property advertisement does not constitute property particulars. The information is provided and maintained by Proctors, Orpington. Please contact the selling agent or developer directly to obtain any information which may be available under the terms of The Energy Performance of Buildings (Certificates and Inspections) (England and Wales) Regulations 2007 or the Home Report if in relation to a residential property in Scotland.